Maggie Smith Recently Won the 2012 Emmy(R) Award for Outstanding Supporting Actress in a Drama Series for her Performance in "Downton Abbey Season 2"
Arlington, Va. - January 23, 2013 - PBS Distribution today announced that it is releasing the highly anticipated Masterpiece Classic: Downton Abbey Season 3 on DVD and Blu-ray January 29, 2013. The return of the hit sensation and its all-star cast, along with the addition of guest star Academy Award(R)-winner Shirley MacLaine, is sure to increase interest in the already phenomenally popular series. The DVD and Blu-ray feature the original U.K. edition of Season 3, more than two hours of bonus video and will be available a little less than three weeks prior to the airing of the finale on PBS. Masterpiece Classic: Downton Abbey Season 3 airs over seven Sundays on PBS beginning on January 6, 2013. The DVD SRP is $49.99 and the Blu-ray SRP is $54.99. The run time is approximately 8.75 hours on three discs. The DVD and Blu-ray sets contain all of Season 3 , including the finale which will air in the U.K. on Christmas Day. The program will also be available for Digital Download. 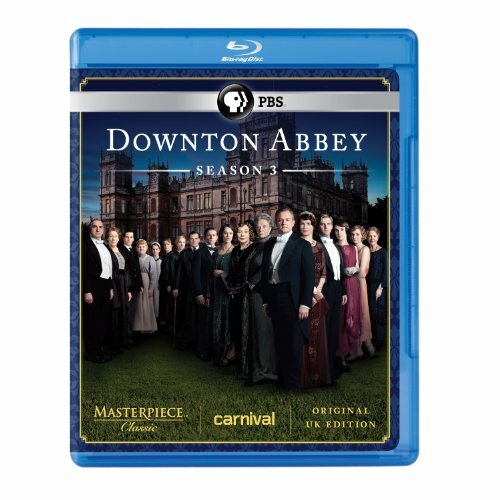 The Great War is over and a long-awaited engagement is on, but all is not tranquil at Downton Abbey as wrenching social changes, romantic intrigues, and personal crises grip the majestic English country estate for a third thrilling season. The returning cast includes Hugh Bonneville, Dame Maggie Smith, Elizabeth McGovern, Dan Stevens, Michelle Dockery, Jim Carter, Penelope Wilton, Joanne Froggatt, Brendan Coyle and a host of others, joined by Shirley MacLaine, who plays Martha Levinson, the very American mother of Cora, Countess of Grantham (McGovern). Years earlier, Cora rescued Downton Abbey with her riches by marrying Robert, Earl of Grantham (Bonneville). Now, new world and old world are about to clash as Cora's mother locks horns with Robert's redoubtable mother, Lady Violet, played by Maggie Smith. Last season closed with the reluctant heir to Downton, Matthew Crawley (Stevens), recovered from his war wounds and ready to tie the knot with the eldest of Lord and Lady Grantham's daughters, Lady Mary (Dockery). Meanwhile, Mary's youngest sister, Sybil (Jessica Brown-Findlay), eloped to Ireland with the political-minded chauffeur, Branson (Allen Leech), and is expecting a child. A tantalizing glimpse ahead: Lovebird servants Anna (Froggat) and Bates (Coyle) face new ordeals in their star-crossed marriage. Downton's impeccable butler, Carson (Carter), breaks in a new footman, who happens to be the nephew of the scheming lady's maid O'Brien (Siobhan Finneran). Following Matthew and Mary's engagement, Robert sticks to his duty to maintain Downton more firmly than ever - even as other great houses are crippled psychologically and financially in the wake of World War I.
Masterpiece Classic: Downton Abbey Season 3 is a Carnival/Masterpiece Co-production, in association with NBCUniversal. It is written and created by Julian Fellowes. Gareth Neame and Julian Fellowes are Executive Producers. The co-executive producer is Nigel Marchant. The Producer is Liz Trubridge. The first two episodes are directed by Brian Percival, who won an Emmy(R) Award for his direction of season one. Other episodes are directed by Andy Goddard, Jeremy Webb, and David Evans. MASTERPIECE is presented on PBS by WGBH Boston. Rebecca Eaton is Executive Producer. Funding for the series is provided by Viking River Cruises and Ralph Lauren Corporation with additional support from public television viewers and contributors to The MASTERPIECE Trust, created to help ensure the series' future.